I'm an intern at the Getty Foundation in summer 2016. While my previous experience was at the Museum of Flight (I was even a bona fide former space camp counselor for three years), I have been exploring museum studies through my anthropology work at Pitzer College, along with fieldwork and archival experience in Brazil. Plus, for years my dad’s Facebook profile pictures have all been the two of us smiling at the Getty, our favorite place to visit in Los Angeles together. 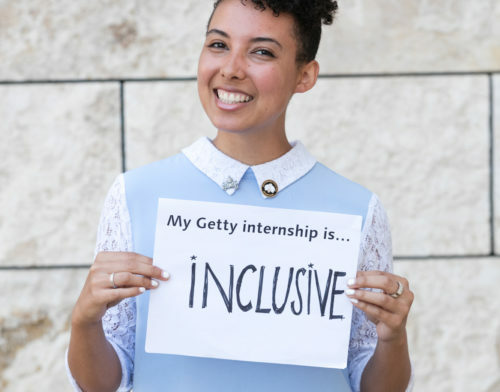 What is meaningful about a Getty Multicultural Undergraduate Internship?